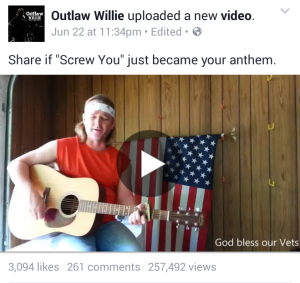 Online PR News – 27-June-2015 – Eureka Springs, Arkansas – Randall George, known as Outlaw Willie in his new Tribute to Willie Nelson show, started a redneck revolution after he released a patriotic country song on Facebook this week titled “Screw You”. “I had no idea so many people would react to it like this. I was just hoping maybe it would get a little attention for our new tribute show,” Randall stated. It’s gotten more than just a little attention. In just 5 days on Facebook, the video had over 250,000 views and 6300 shares. Randall and his brother, Dawayne George, are a local powerhouse known as the George Brothers that travel all over Arkansas, Texas, Oklahoma, Missouri, and Kansas with their three piece band. They play the Cherokee casinos, Billy Bob’s Texas, and are the only house band allowed to play three pieces at the Grizzly Rose in Denver, CO. After hearing time and time again that Randall looked and sounded a lot like Willie Nelson, he decided to give it a shot. “I figured it people want Willie, I’ll give them Willie! It doesn’t matter whose songs I’m doing, I just love to play good music,” George said. Doing a few Willie songs in the George Brothers set turned into doing a full Willie Nelson tribute show separately from the George Brothers shows. Just a few short weeks later that turned into opening their own place in Eureka Springs on June 1st which they named “Outlaw Willie’s”. Dawayne George told us “Outlaw Willie’s is just a cool little place that seats about 50 people where people can come in off their bikes, visit a while, grab a coke and a snack, check out all the stuff on the walls, and then stay for the 7:30pm show if they want. It’s been a lot of fun and it’s just really laid back. I think Willie Nelson would be proud.” Dawayne is the bass player in the show and also sings classics from Merle Haggard and Waylon Jennings. Together the two put on quite a show that feels more like a living room concert than a theater show. 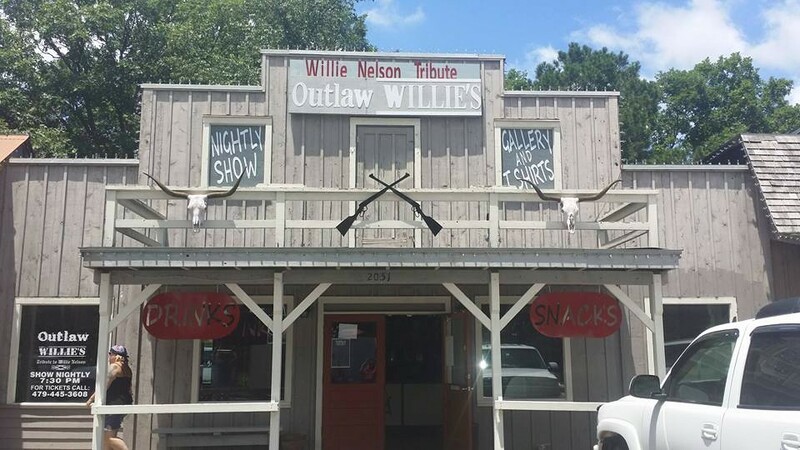 Since releasing the video, Outlaw Willie has received numerous invitations from fans to “come have a beer and a smoke” with them and the band has received gig offers from as far away as New York. To find out more information about the Outlaw Willie, his Tribute to Willie Nelson show, and the new Eureka Springs location you can visit the website at www.outlawwillie.net or on their Facebook page at www.facebook.com/outlawwillie. 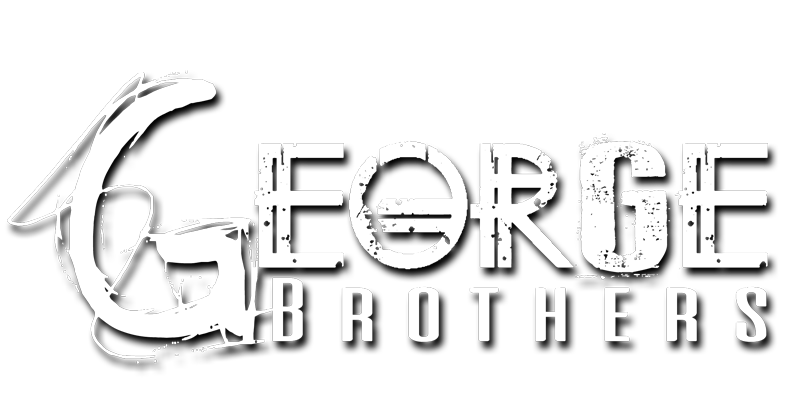 For touring info on their other act, the George Brothers, visit www.georgebrothers.net. For booking inquiries, contact Leslie at leslie@georgebrothers.net or via phone/text at 870-715-2867.